I'm AMAZED by Google's new Tilt Brush which allows you to paint in 3D and which went on sale last week. I think we can expect to art installations being created by this at major art galleries in the near future! Basically you use the space around you as your canvas and a digital paint brush to create multidimensional art. In effect - literally - you paint digitally in 3G space (virtual reality) by using three dimensional brush strokes produced using the Tilt Brush. Consequently it requires a virtual reality headset to execute the work. It uses the HTC Vive device which has won multiple awards and the software is available on the Steam platform. This Chrome Design experiment site is definitely worth a look! 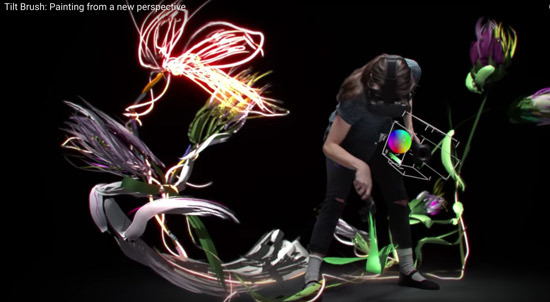 Virtual Art Experiments let loose six artists to see what they could do when using the Tilt Brush in Virtual Reality. You get to choose an artist and the video produced uses a headset so you can see what they are doing. The videos show what happened in real-time speed but you can speed up the videos using the controls bottom right. Some artists are more confident than others - and some work faster than others - in real time! its own Twitter account @tiltbrush - but only one tweet to date (and 2,196 followers so far!). If you want to check out artwork using the software check out #TiltBrush on Twitter - although to be fair what we have at the moment is pictures of lots of chaps with headsets on who don't seem to have quite got the hang of it so far! Bear in mind that like any new media it takes some time and a lot of practice before you get good at using it! and here's some articles I found on the internet (I'll add more if I come across good ones). Google - Tilt Brush: painting from a new perspective - this is the official Google blog explanation of what it does. I'm sure that young people will be thrilled with this new technique and will create amazing pictures. But it is still electronic art, like digital "painting". I wonder if 50 years from now there will be a retrospective of 'classic' tilt brush work or if it's forgotten in favor of the new kid on the block. The shallow culture of today will probably forget that real talent took only the artist and his paint brush to take your breath away. Bernini did '3D' art and didn't need a head set. Just marble and a chisel. Wow! This is fantastic. Where do I sign up? This is almost like the Holodeck on startrek. I can see people creating amazing digital worlds to play in. Of course with all technology there is a down side. But Wow!